Being healthy can seem as if you’re fighting a losing battle sometimes. Working long hours at the office reduces the time you have to spend at home, fixing a healthy meal and exercising. Luckily, some smart man invented dietary supplements to help us get the nutrients we need while working busy days. Dr. Tobias’ Optimum Omega-3 is one such supplement. Omega-3s are very important fatty acids for our bodies. They help everything from joint pain to cell division and growth. Adding a boost of them into our diet is always a good idea. Most of these supplements are derived from fish oils, where the fatty acids we need are very abundant. DHA and EPA are the two main fatty acids found in omega-3 supplements, and they’re very prevalent in Dr. Tobias’ product here. One serving (2 softgels) contains 1,690mg of total omega-3 – quite a good amount. Also, a lot of users have noted that this product causes less stomach issues and fishy burps, as opposed to other products on the market. When you combine the use of omega-3s with regular workouts and a healthy diet, you’ll notice an improvement in blood pressure, and in your sleep cycle. Fish oils have been shown to help aid sleep as well. Whether you’re looking to lower your blood pressure and cholesterol, or simply want to add another healthy supplement to your diet, Dr. Tobias’ Optimum Omega-3 is a great supplement to use, possibly the best on the market. See where Dr. Tobias Optimum Omega-3 ranks on our top omega-3 supplement post. Tastes fishy, but most users don't report fishy burps after taking a serving. Affordable, about middle of the pack as far as omega-3s go. 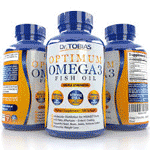 If you need an extra boost to your health, Dr. Tobias Optimum Omega-3 is the way to go.